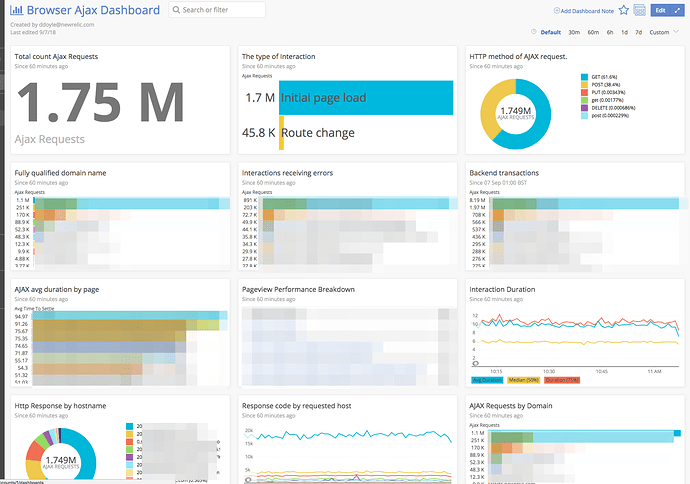 Want to create an awesome dashboard with your Browser data? Where you can view the most popular Ajax request or know what is the most popular trigger. With this Level Up post, I will provide the steps to achieve this. This dashboard will have a FACET widget where you can link the items in that widget to a pre-filtered dashboard of information relevant to just that facet, or filter the results of your existing dashboard. In this section, we’ll go into the details on the purpose of each of the charts. We’ll also show you the query (NRQL) that you can cut/paste into your Insights query bar. HTTP method of AJAX request. Extra Credit - Share your dashboard with the community! Want to be a super “NeRD” (New Relic Developer)? Use the API Explorer to create our Dashboard. Then share your dashboard below and increase your international NeRD cred! (And you’ll earn a cool badge for your community profile!) Here are some quick tips on how to do this. Once the parameters are filled in, click Send Request, you should receive a 200 OK response. Go to Insights Dashboards and search for the ` Browser Ajax Dashboard’. You can now view the Dashboard in Insights by clicking on the All dashboards tab on the left of the Insights home page. "nrql": "select count(*) from AjaxRequest SINCE 60 minutes ago WHERE httpResponseCode not in ('200','201')"
"nrql": "SELECT count(*) from AjaxRequest SINCE 60 minutes ago FACET `nr.interaction.category`"
"nrql": "select count(*) from AjaxRequest SINCE 60 minutes ago WHERE httpResponseCode not in ('200','201') facet httpMethod"
"nrql": "select count(*) from AjaxRequest SINCE 60 minutes ago WHERE httpResponseCode not in ('200','201') facet hostname"
"nrql": "select count(*) from AjaxRequest SINCE 60 minutes ago WHERE httpResponseCode not in ('200','201') facet browserInteractionName"
"nrql": "select count(*) from AjaxRequest SINCE today WHERE httpResponseCode not in ('200','201') facet `nr.interaction.backendTransactionName`"
"nrql": "SELECT average( timeToSettle ) from AjaxRequest facet pageUrl"
"nrql": "SELECT count(*) as 'AJAX Calls',average(timeToLoadEventStart) as 'Load Event Start',average(timeToLastCallbackEnd) as 'Last Callback End',average(timeToSettle) as 'Time to Settle'  FROM AjaxRequest FACET `nr.nameForFaceting` SINCE 60 minutes  ago LIMIT 20"
"nrql": "SELECT average(duration), percentile(duration,50) as 'Median', percentile(duration,75) FROM BrowserInteraction  SINCE 60 minutes ago TIMESERIES"
"nrql": "SELECT count(*) FROM AjaxRequest FACET httpResponseCode, hostname"
"nrql": "SELECT count(*) FROM AjaxRequest TIMESERIES AUTO  FACET httpResponseCode, hostname"
"nrql": "SELECT count(*) FROM AjaxRequest FACET hostname SINCE 60 minutes ago"
"nrql": "SELECT average(jsDuration) FROM AjaxRequest FACET hostname SINCE 60 minutes ago"
"nrql": "SELECT histogram(jsDuration, 10, 20) FROM AjaxRequest FACET hostname SINCE 1 day ago"
"nrql": "SELECT count(httpMethod) FROM AjaxRequest FACET httpMethod SINCE 1 day ago"